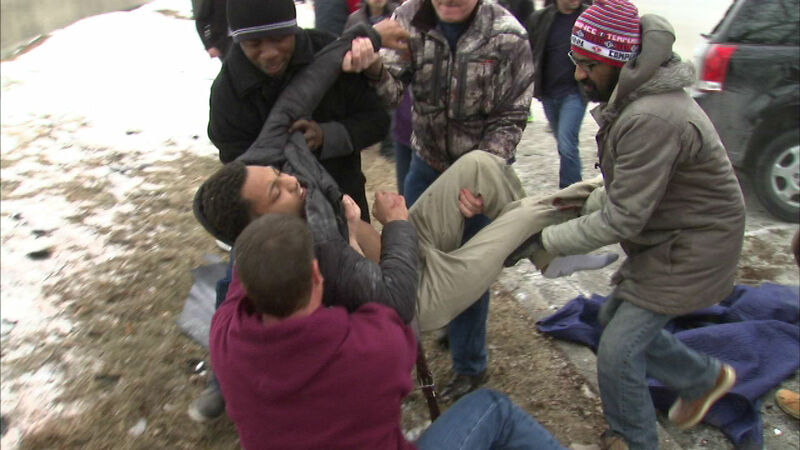 Strangers pulled Erik DePillars, 17, to safety on Saturday, Feb. 21, 2015. He was trapped in his SUV after crashing into a tree on Lake Shore Drive. CHICAGO (WLS) -- A teenage boy is in stable condition Sunday night after good Samaritans pulled him from a fiery wreck on Lake Shore Drive Saturday morning. An ABC7 Eyewitness News reporter and photographer were among the first on the scene Saturday morning when good Samaritans rescued a teen driver from a fiery wreck on Lake Shore Drive. ABC7 Eyewitness News was among the first on the scene when 17-year-old Erik DePillars was trapped in his SUV after crashing into a tree in the southbound lanes of Lake Shore Drive near McCormick Place around 10 a.m. Saturday. ABC7 news photographer John Truitt used his fire extinguisher, as flames engulfed the car right after DePillars was rescued.